There is nothing better than the wind on my back, the sun on my face and my Running Buddies beside me!! It is 5 AM and still dark outside. I have a fuzzy head and achy calves – after effects of a drink too many and some crazy dancing the night before. As I lace up my running sneakers, I ask myself, ‘WHY ? In the name of the Lord WHY do I put myself through this every week !’ To cut to the chase – I have been well and truly bitten by the running bug and my running buddies are waiting. The Running Addiction – means different things to different people. To me….. what started merely as a fitness drive, post relocation to Delhi, has become an inalienable part of my personality….much beyond fitness and health ! Running time is me time. A time to be truly me…truly free. A journey of self discovery. Of finding my limits and pushing the envelope day after day. Of setting goals, making a plan, putting in the sweat and finally achieving it (so much like life). The runner’s high and the kick of doing something meaningful before day-break while the rest of the world still sleeps. Of course new friends, fitness and the compliments are happy by-products… Find your Running Addiction !!! Before I go further, there is some fine print too….a pseudo Ph D in reading too many articles on running.…and an obsessive compulsion to make you hear about it (insufferable at times).….buying just one more piece of running gear because somehow I need it….training schedules, LSD (yes it is a running drug – the weekly long slow distance run) running apps and timings dominate my thoughts. Running addiction is an OCD. Most family and friends support this Running Addiction, but can’t really fathom the depth of it. The big race of the season is over and they are saying, ‘Good Job! Well done !’…and secretly thinking, ‘Thank God, this madness is over !’… and the runner in you is thinking, ‘That was fun ! When is the next big race?’ Only another committed runner and your running buddies can understand this ! ….the Runner’s Bond is unique ! Great pain and over the moon happiness ! Besides the goal, effort, victory….blah, blah….my running buddies see me as I truly am – not a poser or a fake. Nobody is truly ready at 5 AM (and lycra or yoga pants never lie)….nobody is cool at 21.1 km….cheers/expletives come out naturally….they see me truly exposed and genuine (the distance does not permit it any other way)….and my runner friends accept that ! The banter makes the miles fly.…the silences are cherished. They savor and appreciate my running success and support and empathize with my failures. Only my running buddies recognized that my DNF (did not finish) at the Manger Trail was not just a physical failure due to dehydration but a great blow to my self-esteem. Need them – to take it in my stride, learn lessons, reaffirm, re-calibrate, refocus and rise again like a phoenix. Is my entire running group on my running buddy list? Of course not ! The analogy of the difference between friends and acquaintances applies here too ! My running buddy is my Wingman or Wingwoman (just avoiding feminist comebacks. But, seriously, is there such a term? ). My Wingman is my alarm clock, my pacer, my cheer leader, my Hobbes, makes time fly, and never lets me down….I could go on. But that’s not the point…. Find your Running Buddy….Share and cherish the Runners’ Bond. That’s a very well written Distance Running 101! Which was my first dismissive thought. but the point is, however many years we may have run, are we ever past the beginning? Life and injuries make sure you have to start from Zero. Unfortunately, if you have have the baggage of achieving lots as a runner, it means you never start from Zero, you start from Minus! But running is a great Life Teacher. Yes, you are good as your last run. Hi Sanjay, apologies for the late response ! The running addiction is a very personal thing. Running buddies make this journey interesting and fun. But in in the final analysis people will soon forget your PBs and victories….only you will remember…the road is a good listener. Great thoughts and very well put together. Though I am not in the same league as you I have enjoyed your company and whatever we have run together in the past. What I have understood lately is if you are completing a race without injury and enjoying the run, that’s what really matters. There will always be someone ahead of you. So the competition is with yourself and not the crowd. and YES “Life begins outside your comfort zone”. Hi Vinay ! Totally in sync with your views ! And you are an iconic inspiration yourself – full marathons, 1000 km plus bike rides et all ! A great self appreciation. Brings out the real feeling of a die hard, deeply motivated and cheerful runner. At times, I also feel to follow. Nonetheless, I am sure many will be motivated by this extremely well written first hand escapade. Thanks Achalesh. Looking forward to your joining me on my escapades ! It was great to see you burning the road at ADHM – kudos for a fantastic timing. Running is all about the self – you are the one who makes it happen ! Looking forward to many more runs together. Like always you have encouraged me once more to run! May your addiction always keep you high! Great article for those who are still contemplating whether to go for it or not!!! Thanks Ajay for the encouragement. GS, u truly are an inspiration. Keep running, and keep enjoying the process, buddy!! Thanks Mike. Owe a lot to you. Hope that you join us for the upcoming ride ! Looking fwd to some more nuggets of blogging wisdom from you. And thanks for the good wishes. Very inspiring.. i hope to start in a few months. Thanks Shiv Gahlot. Learning the ropes from stalwarts like you ! Having one thought only for as long as possible is Meditation. The average thoughts that our mind generates in 24 hour cycle is forty thousand of them. 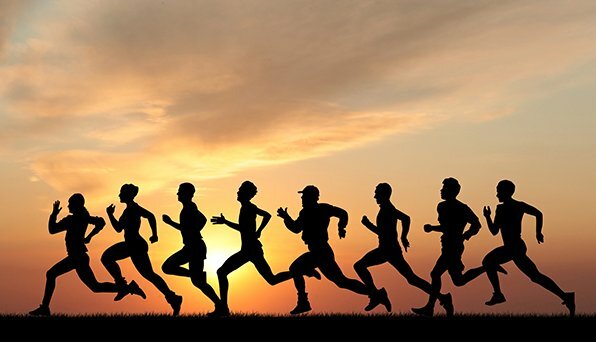 Running helps in us to concentrate on one thought – this is generated by the inspiration of running. So in a nutshell one is Meditating while running. Gee Ess I am proud of you having discovered this phenomena. Wishing you all the very best and millions more healthy days physically and mentally. Thanks PP. You have known me for 29 years – was never a runner. Discovered my passion after moving here. And yes, endurance running is meditation…zen…me time…also a totally new social circle of friends with the same kink. A narration straight from the heart….as pure as it can get..the thoughts and emotions of a runner are well captured…keep it up !!! Wow dude !!! You’re really pressing the pedal, aren’t ya ?? Really proud of yer achievements and yer fab hobby buddy. Here’s to more power to yer wings. PS: Congrats on yer blog – debut !! Fab one at that !! GS, you’re an inspiration…..but I’m still addicted to the two wheels!! From the Heart. True Spirit. Exceptional. Bravo. Keep up the Josh. Thanks. When do we see you ! Remember the midnight run last December ! I do agree running is like addiction. You have narrated it out of personal experience which is outstanding. Like you I also have this nice addiction and have been running in marathons whenever possible or daily running six days 10 to 12 km in 42 to 52 mins is essential or else eating becomes difficult. At the given time in the morning or evening the legs takes you to hit the road. I feel it’s a good addiction but some friends do advise that one should slow down now…only one knows that it is difficult to get out of it now. Kudos… to you to have blogged this article…. Thanks. Really appreciate it + coming from an accomplished runner. Let’s do SCMM or some other run together ! Thank you everyone for stopping by at the wellthy.fit page to read Gee Ess’ thoughts on running!! Truly a champ runner and a wonderful writer! Ha ha. You are right we need more creativity to do the job at hand ! Gee Ess…Well articulated thoughts in your first blog on Running…Wishing you many many more! Thanks Vishal. Learning the ropes from stalwarts like you ! Hey Nikita, glad to share the addiction and madness of running. Gee Ess – well written indeed. Hi JS, thanks for the thumbs up. Hope the tips work and you have a fantastic experience in your first full marathon. Do let me know if they worked. To happy and injury free running. Wonderful article!! I could so much relate to it though I am a very recent addict.. Thanks for the thumbs up Kirti Dags ! Welcome to the tribe. Wish many long miles and smiles of happy running. Even as a runner one should know where to draw the line.